Ukrainian economist Yevgeniya Gorobey will vote for a pro-Moscow candidate in next week's presidential poll even though Russia annexed Crimea and fuelled a separatist uprising in the ex-Soviet country's east. "What is the most important thing right now? To stop the war," Gorobey, who lives in the capital Kiev, told AFP. "I will vote for Yuriy Boyko." In a pro-Western country of 45 million that firmly rejected its Soviet past a significant number of people plan to vote for Boyko or other pro-Russian figures. Of the 39 presidential candidates, roughly four including Boyko are Russia-friendly. None stands a chance of winning the crucial presidential election on March 31 but their combined support among voters stands at around 15 percent. Polls put the 60-year-old former deputy prime minister Boyko in fourth place with more than 10 percent, behind the three most popular candidates led by actor and comedian Volodymyr Zelensky. While the top three contenders -- including President Petro Poroshenko -- run on promises of closer ties with the West, Boyko insists that restoring political and economic ties with arch-foe Russia is important, too. "We should have an absolutely pragmatic course," said Boyko, who won 0.19 percent of the vote during a presidential election in 2014. "We should act in the interests of the country -- in some areas we will restore our relations with Russia for sure, we have lost this market," he told AFP. This week Boyko travelled to Moscow for high-profile economic talks with Russian Prime Minister Dmitry Medvedev, sparking Poroshenko's anger. Friday's talks centred on the importance of resumption of cooperation including in the gas sphere and included energy giant Gazprom chief Alexei Miller and Ukrainian politician Viktor Medvedchuk, who claims President Vladimir Putin is godfather to one of his daughters. "They are discussing economy while our boys are dying on the frontlines," a seething Poroshenko said of the Moscow talks. Boyko, a former member of Yanukovich's largely moribund Party of Regions, also contradicts Kiev's line by insisting on direct talks with Kremlin-backed separatists. Mykhailo, who lives in the government-held port city of Mariupol in eastern Ukraine, also said he would vote for Boyko. "The current authorities did not allow opposition forces to develop," said the 63-year-old pensioner, who declined to give his last name for fear of reprisals. "Even under Yanukovych the opposition had more opportunities than now." 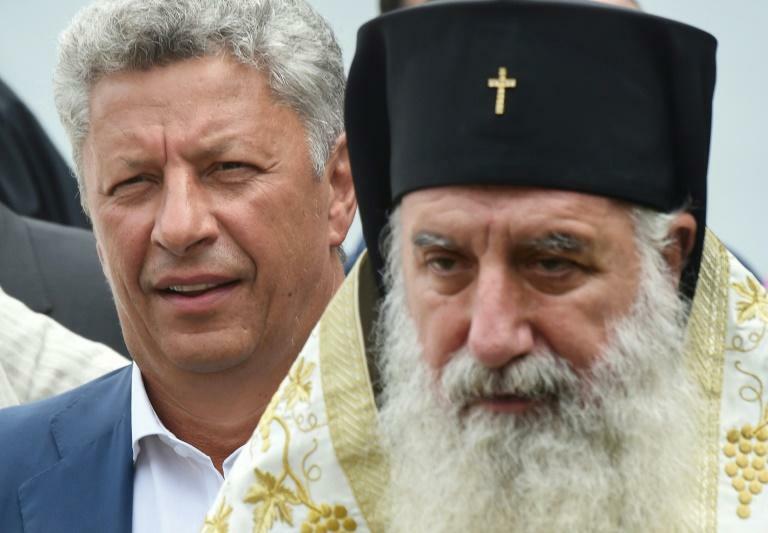 The newly established Orthodox Church of Ukraine -- which has recently won independence from Moscow -- this month warned voters against supporting candidates who appear to promote peace but in fact urge them to "surrender to the enemy." But observers say that despite Kiev's pivot to the West after a popular uprising in 2014 some Ukrainians had nostalgic memories of life under the Soviet Union and backed closer ties with Moscow. "Very often they are ready to support candidates who are well-disposed towards Russia," said political analyst Mykola Davydyuk. Boyko is backed by Dmytro Firtash, a tycoon with links to the Kremlin and former Donald Trump campaign chief Paul Manafort, and his TV channel gives him ample airtime. Given Boyko's high profile, his party, the Opposition Platform, appears set to win parliamentary seats during legislative polls in October. Pro-Moscow candidates have traditionally enjoyed popularity in the country's Russian-speaking eastern and southern regions but the annexation of Crimea and the outbreak of the separatist conflict undermined their support base. Of roughly 6 million people living in annexed Crimea and separatist-controlled territories, many will not be able to take part in the vote. Other pro-Moscow voters have been disillusioned with Russia's tactics. "They did not expect Russian forces to arrive and start killing people," said analyst Davydyuk. The country's pro-Russian opposition has also been undermined by infighting and has failed to agree on a single candidate ahead of the election. Boyko and Oleksandr Vilkul -- another pro-Russian contender with ties to Ukraine's richest man Rinat Akhmetov -- have accused each other of not playing fair. Boyko supporter Gorobey said that despite everything he was trustworthy and stuck to his guns. "He is not a turncoat."